Totally agree with you on the natural light lip perfectors and the Shu eyelash curler. I'd add Clinique's Take the Day Off Balm to the list – This is on my automatic 'must repurchase list'. Couldn't live without my Clarisonic now, my skin is so much better. I feel like I'm one of the only people who doesn't love The Porefessional! I have to say, NARS Sheer Glow is a cult product that is pretty darn amazing. I haven't tried the GA Luminous Silk foundation as I opted for sheer glow but it is definitely the next high end foundation I want to try! 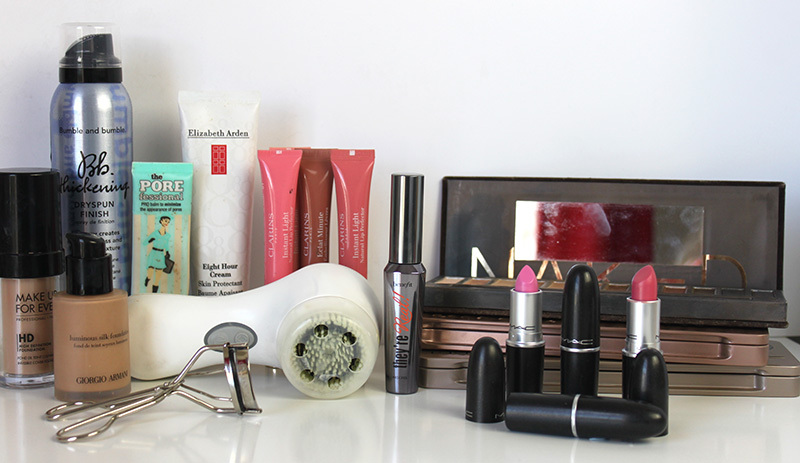 So many of these are some of my favorite products! Unlike you though I am super addicted to my Clarisonic! Great post! For being such a huge Benefit fan, I can't believe I only picked up the Porefessional a few weeks ago. Can't see myself going back now. It's such a great primer! Id love to place a cult beauty order! I'm with you on the MAC lipsticks, just as long as they don't increase the price anymore! Although I actually didn't like the Bumble and Bumble dry spun finish! I couldn't agree more about the clarisonic; I love mine. Great Post! Great post and amazing picks. Clarins lip Perfectors happen to rock my world. Same with the Dior Lip Glow! So many products here I own and LOVE! I think I will finally have to give in and get some Porefessional primer. I absolutely love Porefessional and I think you are the only person who named my go-to eyelash curler! How on earth do you purchase the make up forever foundation here in the UK? I really want to get it but I don't know my colour! So I'm having a predicament!